Connor McAliskey's long-awaited return to the Tyrone senior football team has not only provided manager Mickey Harte with interesting selections but has raised hopes that a respectable position can be attained in the Division One table. The Clonoe marksman certainly made an impact when he lined out for the first time this year against Cavan last weekend and is now primed for action in Tyrone's next assignment against Dublin at Croke Park on Saturday-week. Manager Harte, aware that victory is essential if his side is to stave off relegations worries, believes that McAliskey's arrival back in the fold could not be more opportune. "Obviously Dublin are always difficult opponents in Croke Park but we will go there in a better frame of mind because of our two recent wins," observes the triple All-Ireland winning boss. "It was good to have Connor McAliskey back to join other people who have been doing well for us lately." McAliskey missed the greater part of the 2017 season after suffering an injury against Cavan in the Dr McKenna Cup but returned to the Red Hands line-up at the start of last year. He went on to become joint second-top scorer in the All-Ireland Football Championship with 2-41. But misfortune was to strike again when a serious ankle injury sustained while helping his club in the Tyrone county championship last Autumn was to keep him sidelined for six months. Now that McAliskey is back in action, however, Harte is hoping that the Tyrone attack will carry greater potency in the remaining league games against Dublin and Galway. Tyrone's recent back-to-back wins over Monaghan and Cavan have eased their relegation worries slightly while at the same time spawning the belief that the team can finish their itinerary on a high. 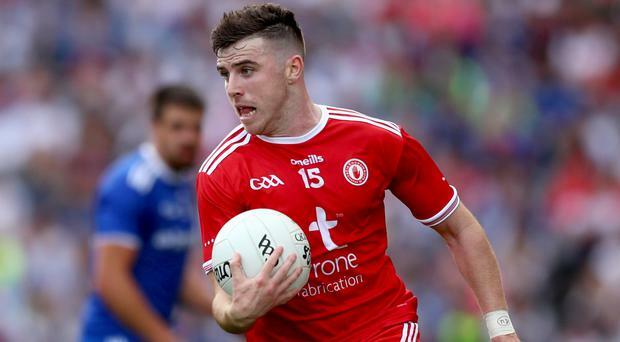 Though it is something of a long shot, the possibility of Tyrone perhaps squeezing into the league final proper would be welcomed by Harte as this would give his team another competitive outing in the build-up to the Ulster Championship opener on May 12. Tyrone spokesman Eugene McConnell makes it clear that this is a "massive game" for the Red Hands. "Whatever about the league, the championship is what it's all about and we know that Derry will be very tough opponents now that they have been promoted from Division Four," he explains. "We would not be reading too much into what level they are playing at just now as they will be a different animal come May." Meanwhile, sometimes a rub of the green can prove important in helping to fashion a team's progress although more often than not strength in depth tends to be the deciding factor in sustaining a drive to success. Down manager Paddy Tally, though, has not taken long to discover that a fusion of both these elements can transform a team's fortunes. When defender Ryan McAleenan suffered a leg injury at the start of last month, it was initially feared that he could be ruled out for the remainder of the Allianz Football League. But a speedier than expected recovery now sees McAleenan chomping at the bit again as the Mourne county seek to extend their current four-match unbeaten surge by getting the better of Carlow and Louth in their last two games in order to clinch promotion to Division Three in style. If McAleenan's return had more than a little to do with last weekend's handsome win over Offaly in particular, then a cursory glance at the starting line-up for that game will provide confirmation that manager Tally's experimental approach in the recent Dr McKenna Cup is already paying handsome dividends. With Carlow looming on the horizon on Saturday week, Tally (below) is hardly likely to deviate too much from the line-up which devastated Offaly in a power-packed second-half performance last Saturday. "I thought that the boys who came off the bench against Offaly made a big impact but that has been the pattern so far this year," maintains Tally. "The lads who are showing good form in training are also showing that they can carry this into the games and this is what is standing to us. "That bit of solidity within the side and especially at the back which is provided by players like Darren O'Hagan, Kevin McKernan and Caolan Mooney is proving very important to us." Meanwhile, Bellaghy's Barry Cassidy will referee the forthcoming All-Ireland Club Senior Football Championship final between Corofin and Dr Crokes. Cassidy (40) has been an ever-present on the referees championship panel since being selected for the 2012 season. And if Cassidy will be in the limelight in the club final, then it's the Derry hurlers who will have their place in the sun on Sunday when they take on Wicklow in the Division 2B Allianz League Final. In his first season as manager, former Dublin Under-21 boss John McEvoy has worked the oracle with the Oak Leaf side and now he is keen to see his players take the big step up. Derry have been particularly consistent this year but in Wicklow they will be meeting a stubborn, abrasive side that will not yield lightly. Armagh will also be in action on Sunday when they lock horns with Roscommon in the Division 3A final at Pairc Tailteann, Navan. This will be a stiff challenge for Padraig O'Connor's side as they have already fallen to Roscommon in the competition.